Mushrooms if cooked in Chinease way into yummy dish, it would tast like heaven. Whether it's been fryed with vegetables or made into soup with chicken, the finest cookers would made it taste similar to the most expensive fish, or exceed its flavor with its unique flavor words hard to describe. You would feel so lucky if you are tasting the wild wild mushrooms, happiness is so easy to reach then. You could eat as much of it as you could since it's so good for your health. Mushrooms contain antioxidants, the Zena-Warriors in the fight against diseases like cancer and heart disease. 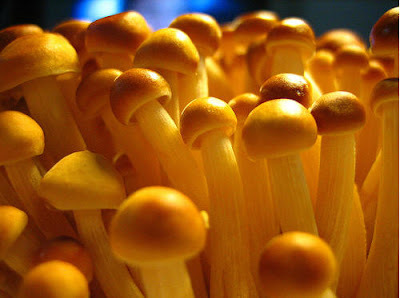 The antioxidant specific to mushrooms is called l-ergothioneine. Shiitake, maitake and oyster have the highest levels of this powerful antioxidant followed by portobello and crimini and then white or button mushrooms following. Mushrooms contain beta-glucans, a complex carbohydrate glucose molecule or polysaccharide, which is a type of soluble fibre. These appear to not only have anti-inflammatory qualities but they can help rev up your immune system by creating disease fighting T-cells. With the flu season here we need all the help we can get. Wash your hands often, eat lots of fruits and veggies, and eat mushrooms regularly.